[By Nick, New for 2014] ‎Next up for Nick week is a double shot of sorbets I got for free, courtesy of Ciao Bella. Summer is coming to an end but these two flavors sound like they'd be able to make it feel like summer all year long. 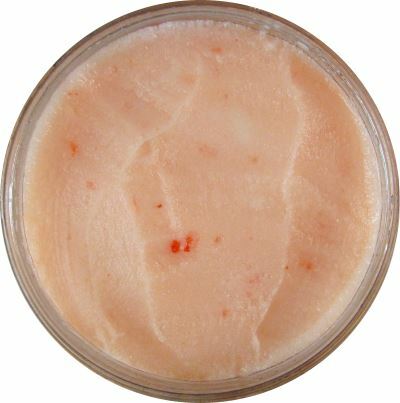 Let's start things off with the Whole Foods exclusive Ciao Bello Wild Italian Strawberry Limonata sorbetto. This one basically sounds like a fancier version of strawberry lemonade. I'm a fan of that drink so I'm excited to see how it plays out in frozen form. When scooping this one, you get that icy smoothness I've mentioned in the past. Not the creamiest sorbet for sure but not something you're chipping away at either. The flavor on the other hand is very intense. Remember that time when you put too much lemon in your lemonade? Well that's exactly what's going on here. On a scale of 1 to 10, this is an 12 when it comes to tartness. I know some people are a fan of that tartness but it's just not for me. The lemon just dominates everything but at least you do get some strawberry sweetness in the aftertaste. Like I said, I'm not a fan of tart things so I'm ready to move onto the other sorbet already. 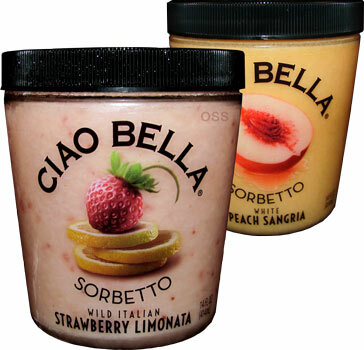 Okay time for Ciao Bella White Peach Sangria sorbetto. First off, what is with the lack of peach flavored frozen desserts? Both Ben & Jerry's and Haagen-Dazs killed off their ice cream this year. Outside of rogue peach base only flavors and sorbet, there really isn't all that many options out there for those who enjoy peaches such as myself. 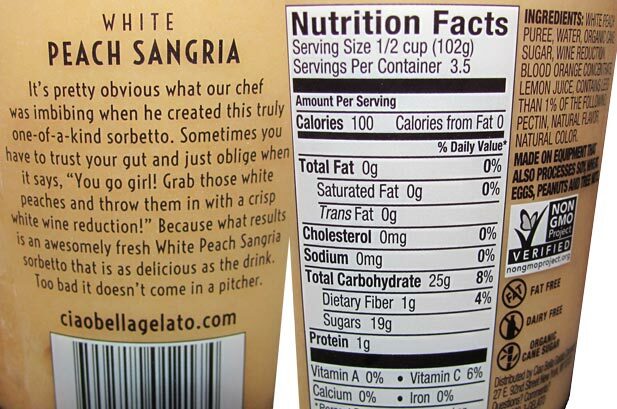 Also being that I don't drink, I have absolutely no idea what a peach sangria is or what it should taste like. Thankfully there's the internet for such questions. Actually I lied because the internet gives me a bunch of different recipes, none of which are close to the same. Let's just say there's white wine and peaches involved. The texture here is the same as the other sorbet but the flavors are night and day. The sorbet is nice and mellow. 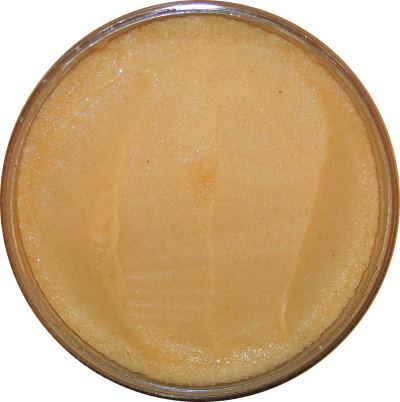 The peach flavor is on the forefront and has a crisp freshness to it. This is definitely something for those looking for a light, refreshing dessert on those hot and humid days. I'm not really picking up any of the other ingredients that are in the traditional drink but I don't really care. 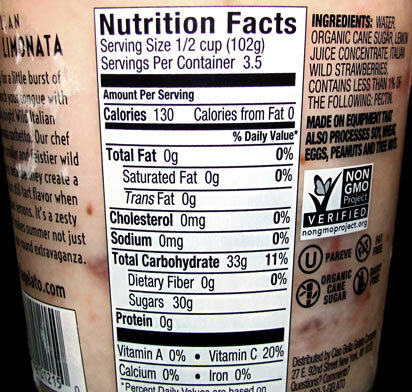 This is one of the better sorbets I've tasted and would recommend it to just about anyone who enjoys a nice peach. But it can be quite a dilemma. On the one hand, if I'm in the mood for a peach I'd rather just grab the fruit itself, cut into little bite-sized pieces and then start the munching! On the other hand, sometimes it takes a while before I get in the mood and by then my peaches have gone from firm to mushy and nasty.